The evil witch Hexana kidnapped Hugo's family and he has to rescue them. This game contains five ported levels from the popular TV show: Level 1/1: Hugo is driving on a draisine and has to dodge oncoming trains and dead ends by changing the tracks. On the right side of the screen is a map of the route. 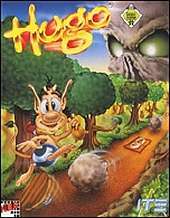 Level 1/2: Hugo has to cross a forest and has to dodge several obstacles by jumping over them. Level 2/1: Hugo is climbing a mountain and has to dodge oncoming stones by jumping over them. Level 2/2: Hugo is flying a airplane and has to dodge oncoming balloons. Level 3: You have to choose between three ropes. If you choose the right one your points get doubled. In every playthrough you have to beat three levels which you choose beforehand. You have to select either 1/1 or 1/2 and either 2/1 or 2/2. Because the levels were created for a TV show where you had to control Hugo with your phone buttons, the controls are simple: Depending on the level there are just two or three buttons to press at the right time. The levels contained in Hugo were originally released as Hugo - Pa Nye Eventyr and Hugo - Pa Nye Eventyr II on the Amiga. A CD version was later released in 1996 with the same content.